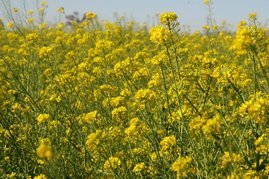 About honey bee forage and cover crops for almond growers - Project Apis m.
PAm has developed seed mixes to provide floral diversity prior to and after almond bloom in California for the nearly 1.8 million colonies that will be brought to the state to pollinate the 2016 almond crop. 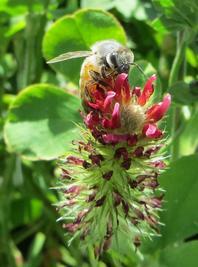 Just like humans, honey bees are better able to deal with stressors if properly nourished. With proper nutrition, bees can fend off pests and parasites and cope with pesticides and transportation stress. Working with land manager cooperators, PAm has established acreage, seed mixes, seed suppliers, and planting regimes. 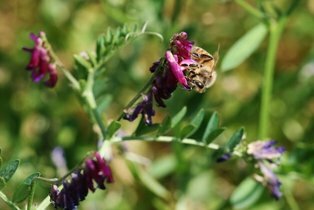 An understandable concern on the part of almond growers is whether a flowering nearby cover crop will divert honey bees away from the almond bloom. The efficient pollination of your crop is top priority. In-the-field research shows that providing honey bees forage prior to almond bloom can actually increase the frames (or numbers of bees) and that these bees are healthier and more robust to pollinate your crop.